Lightly spiced and far less sweet than most store-bought coffee bread, Swedish Vetebröd serves as a satisfying snack to pair with your favorite brand of coffee. After punching down dough following its first rise, remove from bowl and knead lightly on a floured counter until smooth and shiny. Divide dough into two halves. Divide each half of the dough into three equal portions. Roll each portion into a long, thin “snake” (about 18 inches long). Braid three of the “snakes” together, folding and pinching outer edges under to form a loaf shape. Repeat for the second set of three dough “snakes.” (Alternative: Do not divide dough into 2 halves, but separate entire mass into three equal portions. Roll the three portions into “snakes,” braid together, then join and pinch ends together to form a single braided bread wreath). 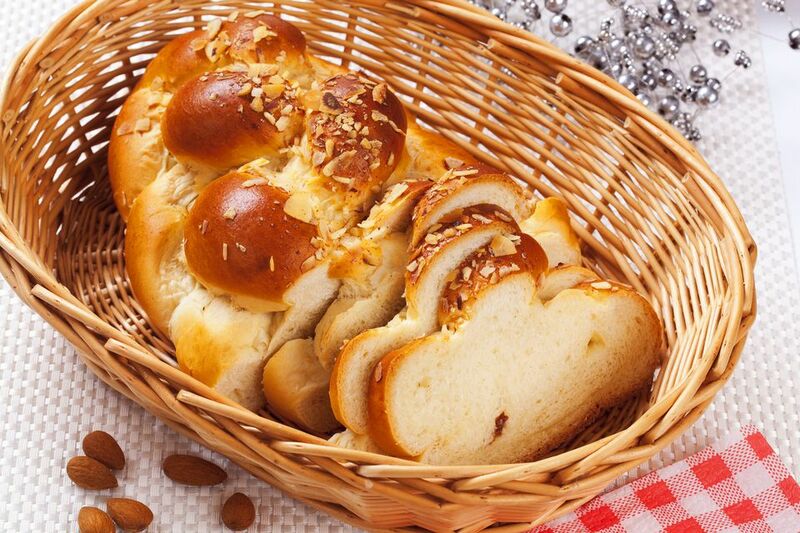 When loaves (or wreath) have doubled, brush with egg wash and sprinkle with pearl sugar and/or almonds. Place in the middle of a preheated oven and bake for 25 minutes, or until done.